While she may be the home’s nutritional care manager (NCM), Kori Bigelow-Tarr’s contribution to Rosebridge Manor extends beyond the kitchen. 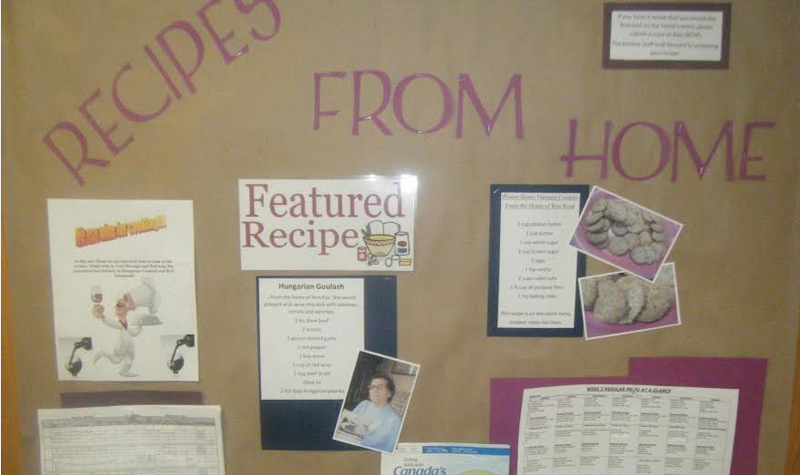 Rosebridge Manor’s bulletin board is showcasing a photo of resident Hazel O’Shea along with her recipe for lemon squares. 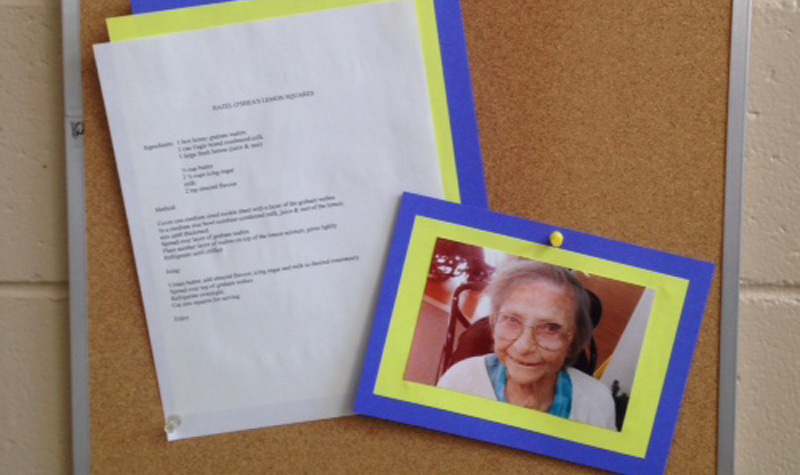 Pictured above is a bulletin board at Country Terrace with a featured recipe from a resident. Rosebridge Manor learned of the home’s idea to create residents’ favourite recipes and is planning to launch a similar program. 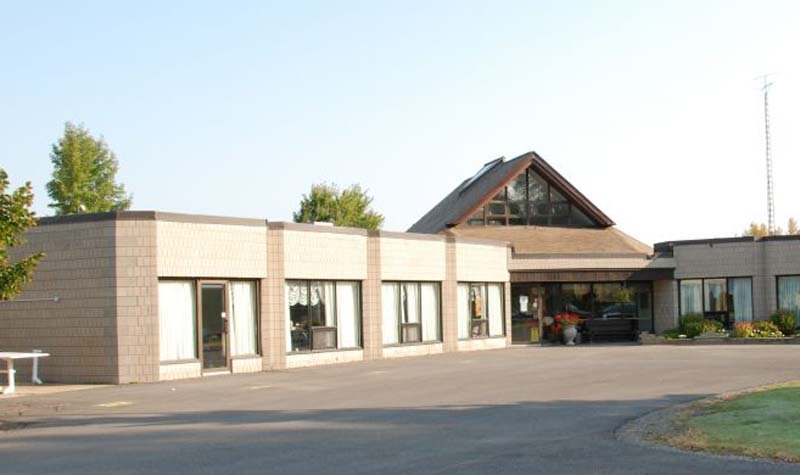 Rosebridge Manor staff members will meet today (April 2) to discuss the next step in the nutritional care department’s plan to start incorporating residents’ favourite recipes into the Jasper, Ont. long-term care home’s meal plans. Nutritional care manager Kori Bigelow has already got the ball rolling by inserting a notice in the home’s most recent newsletter to families asking them to share recipes their loved ones enjoy. 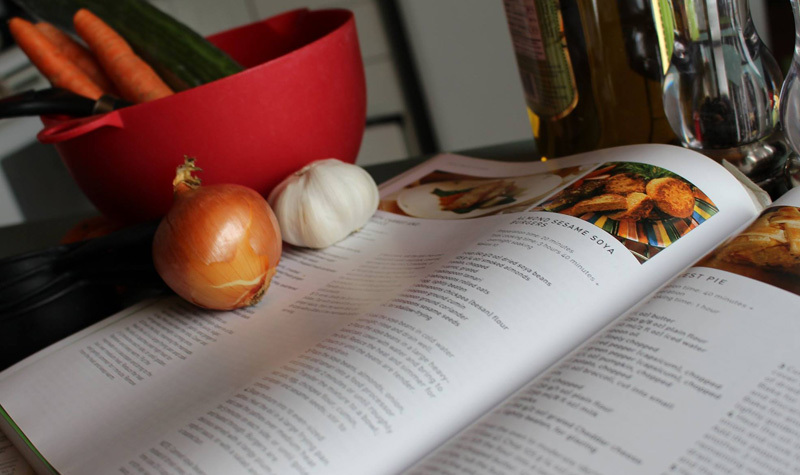 In February, The OMNIway published a story about how another OMNI Health Care home, Country Terrace, started preparing residents’ recipes. The idea was the brainchild of that home’s nutritional care manager Alex Achillini, who was often being asked by residents if he could prepare some of their favourite meals. Bigelow read the article and liked the idea. She e-mailed Achillini shortly afterwards to express interest in replicating the program at Rosebridge Manor. Following the success of Country Terrace’s program, Rosebridge Manor’s nutritional care department will be working with the life enrichment department to gather recipes from residents and their families. This will be an important part of the process in making the program successful at Rosebridge Manor, Bigelow says. Like Country Terrace, Rosebridge Manor also plans to create an area on the home’s bulletin board displaying residents’ recipes and the story behind each one. Bigelow says she hopes to see many residents share their recipes, and would also like to see other OMNI homes create a similar program. 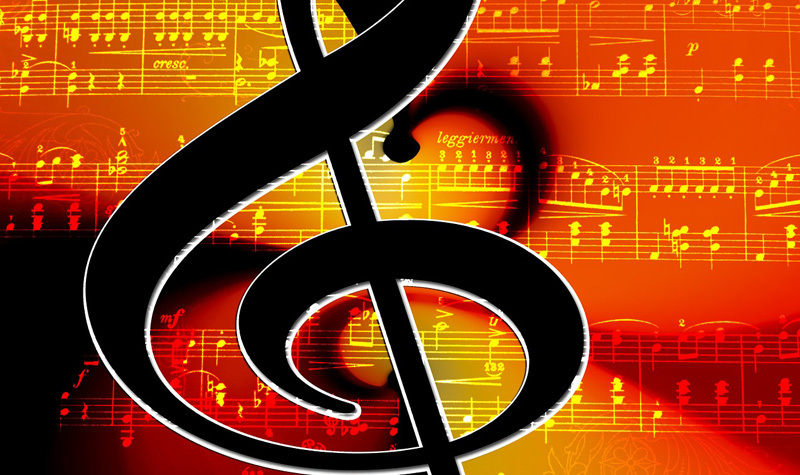 If you have a story you would like to share with The OMNIway, please contact the newsroom at 800-294-0051, ext. 23, or email deron(at)axiomnews.com. If you have feedback on this story, please call the newsroom at 800-294-0051, ext. 23, or e-mail deron(at)axiomnews.com.